Mother nature has blessed us with some awesome weather lately. Mild temperatures and lots of sunshine around the Treasure Coast has been a welcome change from all the rainy months we have endured this year. 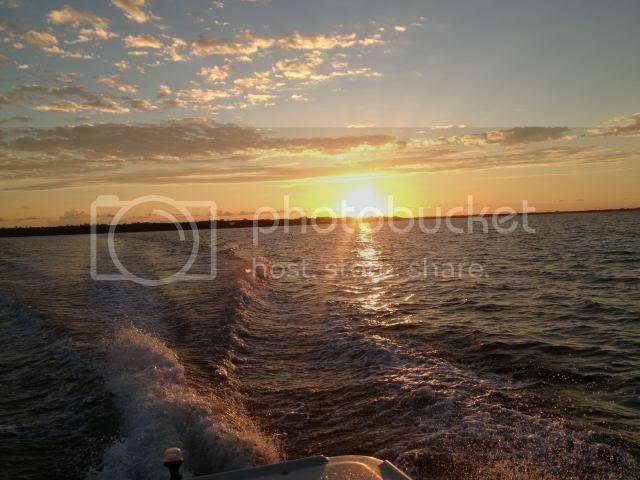 Fall always brings us fantastic weather and the fishing is just as good around the area. Water temperatures are slowly cooling down as we continue to transition towards the winter months. You can still find lots of baitfish around the area and the fish are feeding heavily on them right now. We have enjoyed a variety of species on each adventure to keep the anglers having lots of fun. Mark Amorello was down for a few days and we got to get out on a nice morning. We found a variety of fish including trout, snapper, mackerel and other hungry critters. Don, Art and Sherman were back for another fishing adventure. 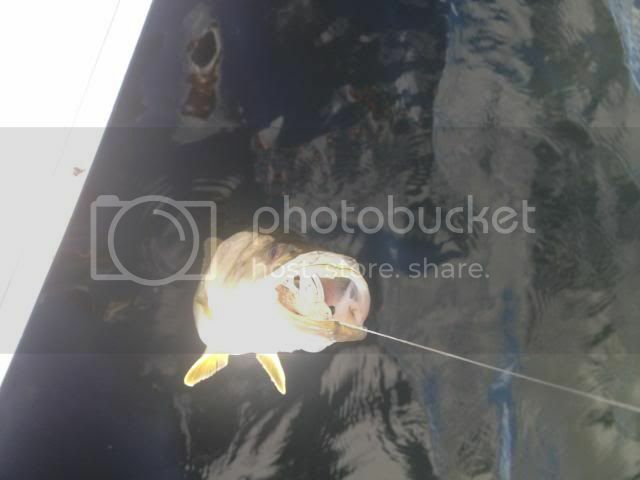 The guys caught lots of fish including trout, bluefish, snook, snapper and several other kinds. 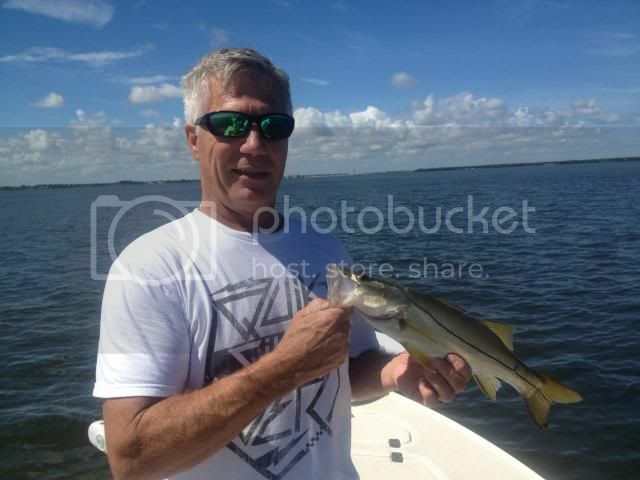 Ron and Jan found snook, redfish, snapper and assorted other fish to make for an enjoyable morning. Pete and Ray came out with me on a windier morning, but they had a good bite and found a lot of fish biting. The highlight was a double hookup with two big redfish that took them both for a ride under the mangroves. Somehow they got both fish out for a photo and release. Captain Joe Ward and I took a morning off to get out and play on the water for a while. We found lots of short snook, a few reds, mangrove snapper and the usual feeding frenzy in the turning basin of mackerel, jacks and ladyfish. 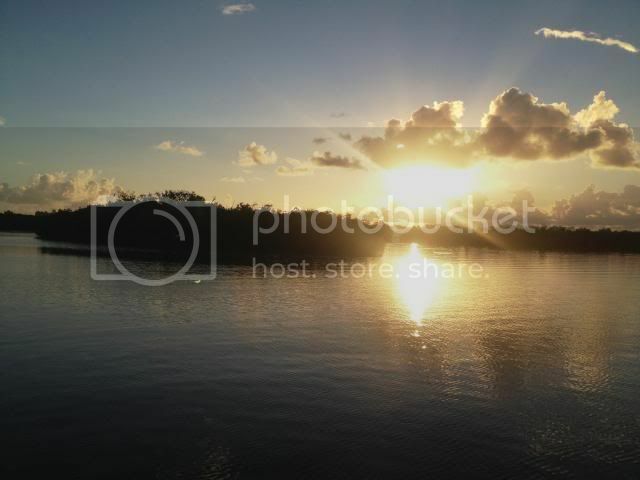 It was nice to relax and enjoy the river! The snook bite has been good around mangroves, docks and around the inlets. Those fishing at night are catching some big snook this time of year. Anglers are using live bait, feather jigs, top water lures or DOA Bait Busters for the snook. 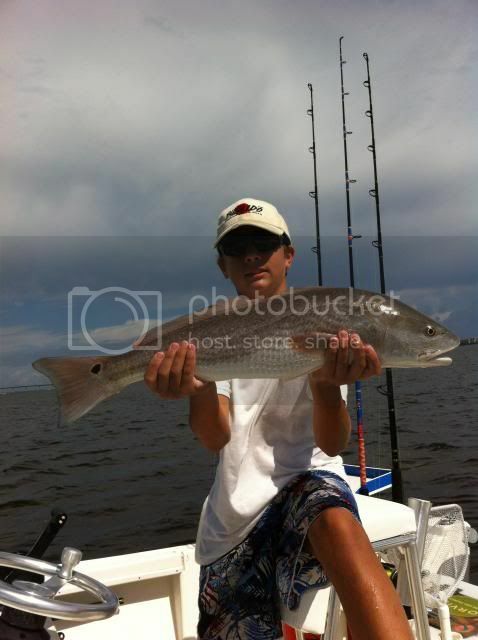 Redfish will hit live bait, DOA shrimp or CAL Paddle Tails this time of year. Most of our reds have come from under docks or mangroves. Sea trout have been hanging in two to five feet of water. Try DOA shrimp or top water lures for good results on the trout in November. You can find lots of snapper all over the river. The docks have provided us with some nice catches of keeper snapper. Bridges and channel edges are also great places to target snapper and sheepshead this time of year. Most anglers will be using live or dead shrimp. The inlets have been full of jacks, blue runners, mackerel and ladyfish on the incoming tides. The macks have been good sized ones and great table fare. Small shiny lures have worked very well. Try the CAL shad tail in the 382 color on these fish. There have been some pompano showing up with the change in weather patterns. Try along the surf with sand fleas when you can find them. Watch for them in the river soon! October has been a very productive month for us and November should be even better! Have fun and get out fishing soon! 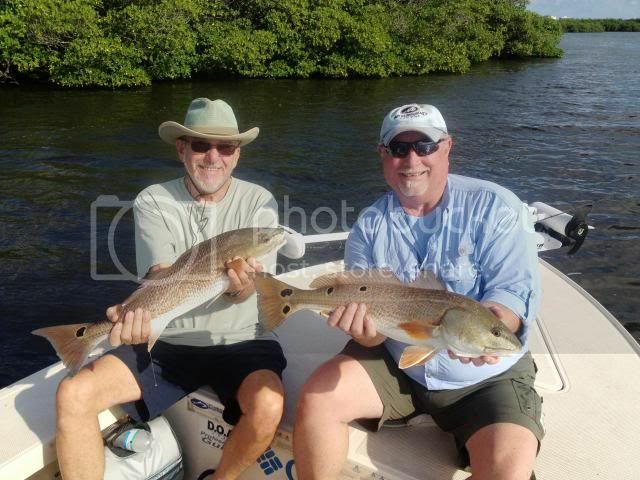 Pete and Ray showing off their double catch of nice sized redfish! 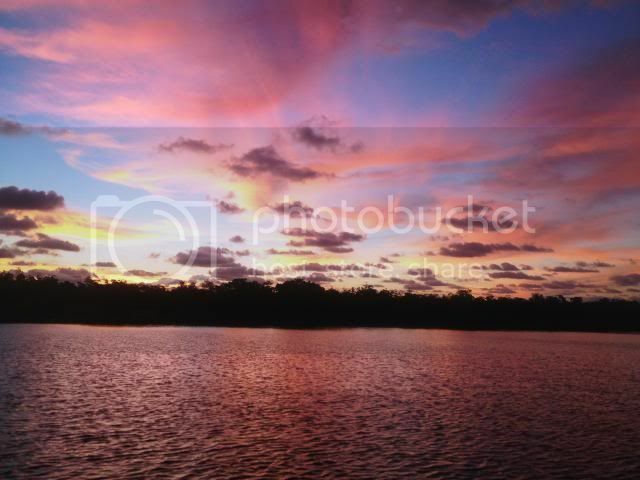 November is always a fun month to enjoy the fishing along the Treasure Coast. We are in the middle of our winter transition and you can also count on cooler temperatures that will start the thermometer sliding when it comes to the water temps as well. The days will remain nice and warm, but the nights will become cooler this month. It’s time to change your fishing tactics out on the water. We enjoyed a very mild winter this past year and hopefully it will be the same again this winter. The fall mullet run will continue into November and bring lots of action to the inlets, rivers and beaches throughout the area. Don't forget that November also brings changes in several manatee zones around the area. The Fort Pierce channel around the bridges will be a slow speed zone as of November 15th. Read the signs! Trout will continue to be a target of many anglers. The trout bite will be good on the flats, but you must move to the deeper areas as the temperatures cool the water down. Look for them to be in three to six feet of water this month. My favorite lures are DOA shrimp or Deadly Combos when trout fishing. Don’t forget to fish the sand holes and drop offs on the flats. Many sand holes are much deeper than the flat and you can expect some nice fish to be hiding in them waiting for that easy meal to drift by. Harbor Branch is especially productive for me during this time of year as well as the Midway Road area. It was a fantastic year for big trout in 2013. 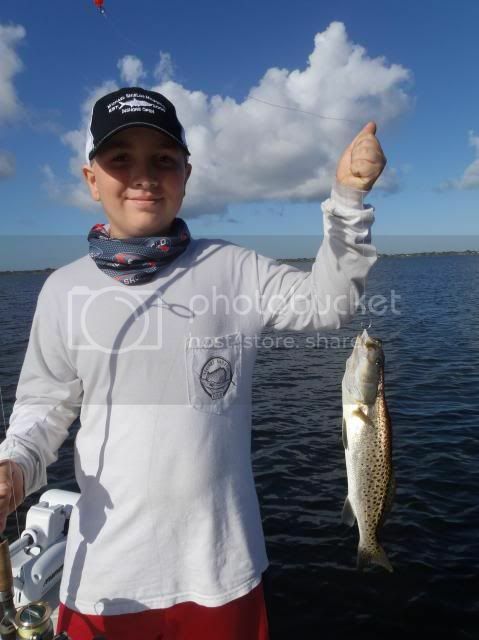 There have been lots of big trout around the Fort Pierce area this year. The pompano beginning to return to the river and will be a favorite target for anglers throughout the winter. When fishing the surf, use sand fleas or clams and the same in the river. Don’t forget to try a Doc’s Goofy Jig for the pomps. Many are located when they skip behind the boat wake. Keep your eyes open for them. 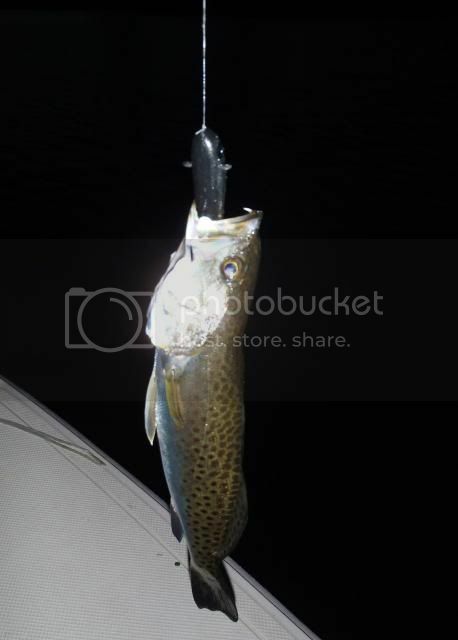 The snook bite will continue to be good, especially at night. 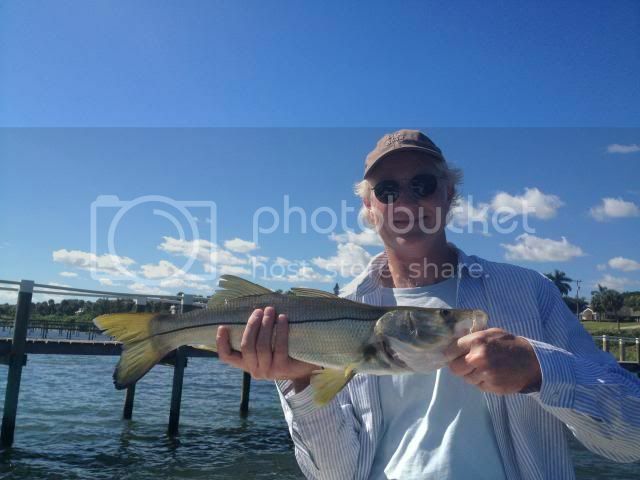 The inlet, jetties, bridges and docks around the river will be holding snook. Lighted docks are very popular when night fishing. Live baits, Bait Busters and Terror Eyz are very popular for snook fishing. Don’t forget the spillways when the water is running over them. 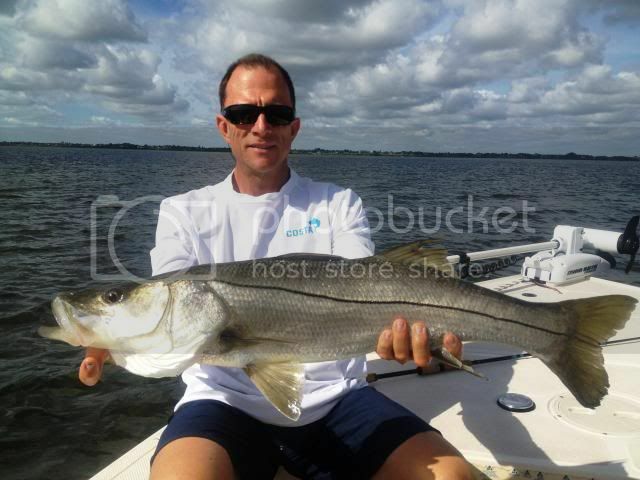 They can be another very productive area for snook. Redfish can be found hanging under mangroves during the day and will strike a DOA shrimp or CAL jerk bait. You might also find some hanging under some of the docks around the river. Look for them in shallow water as long as the sun keeps the temperatures warm. I love the CAL grub tails this time of year around the mangroves. A gold spoon can be another good lure in winter for hooking up on a redfish. 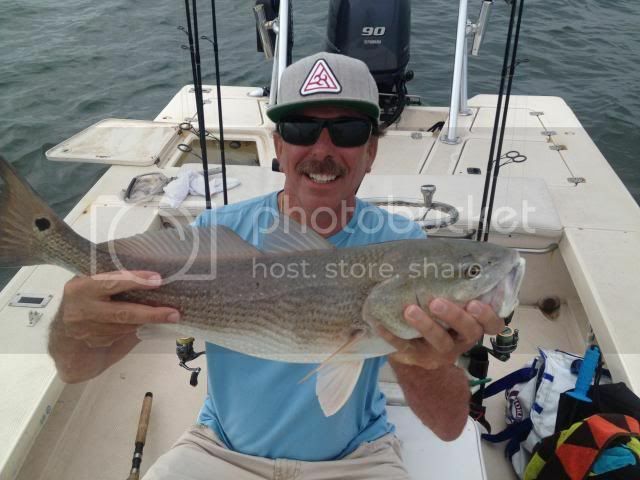 These photos are of Bradley Redington and his friend, Kyle Derrick, who enjoy fishing the Indian River. 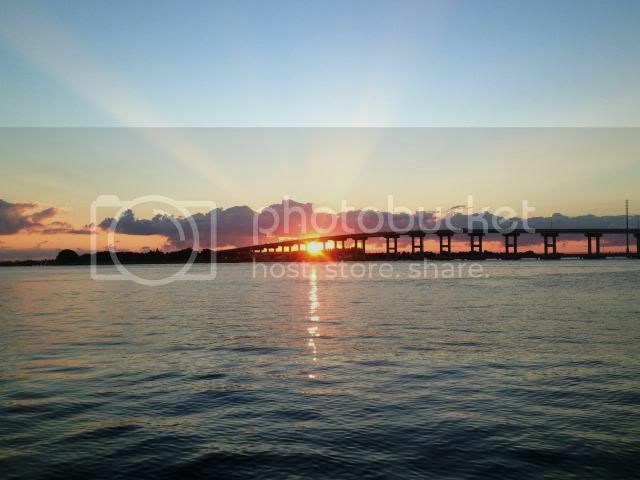 Photos were sent by David Redington. Great fishing guys! We have enjoyed some gorgeous fall weather this past week. Less rain chances and more sunshine has been the norm for us. 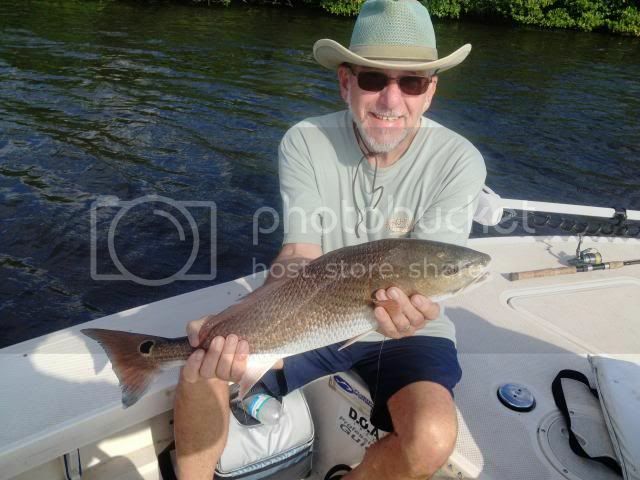 Mild temperatures have arrived on the Treasure Coast and it's been very comfortable to enjoy fishing the area. Expect more of the same weather pattern in the coming weeks. Tides have been very high this week with the full moon approaching. We get these higher tides every year in the fall and they have been two to three feet above normal lately. The mullet run continues around the area and the fishing has been good for us. 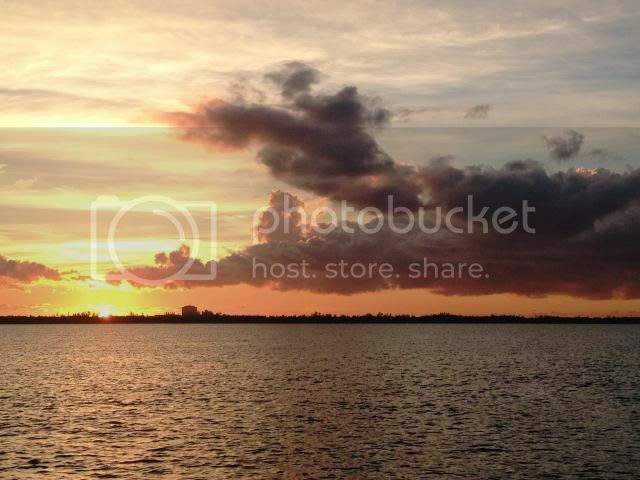 Fall is a wonderful time on the Treasure Coast! We have had a good variety of fish biting most days on the Indian River. 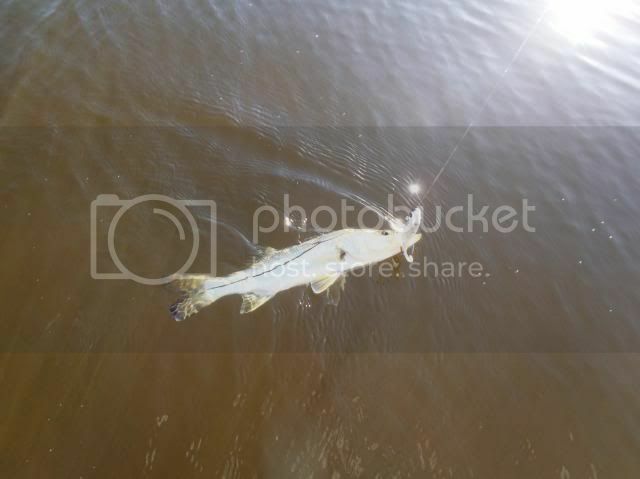 Snook, trout, redfish and various other species have been hanging around mangroves, sand bars and grass flats and feeding on the incoming tides for us. Mike and Kelly joined me for a morning adventure on a windy day. 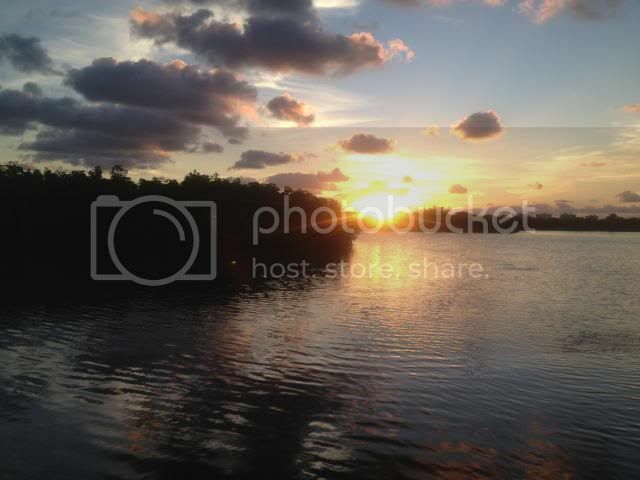 Fishing around the mangroves, they caught redfish, snook and lots of mangrove snapper. Mark and Chris was out on a beautiful morning to find snook, redfish, trout and a host of others feeding around the mangroves and on the sand bars. Ken and Larry found a similar bite the next day that also included a frenzy of mackerel, jacks and ladyfish around the turning basin to finish off a gorgeous day on the water. It was a fun week on the water! Our trout have been caught on the grass flats in two to four feet of water. Deadly Combos, CAL shad tails and top water lures have worked to get some nice trout to bite. There are lots of juvenile redfish and snook along the mangroves to the north of Fort Pierce. Looks like a fantastic crop for next years fishing! CAL curly tails are great around the mangroves right now. Snapper have been just about everywhere lately. 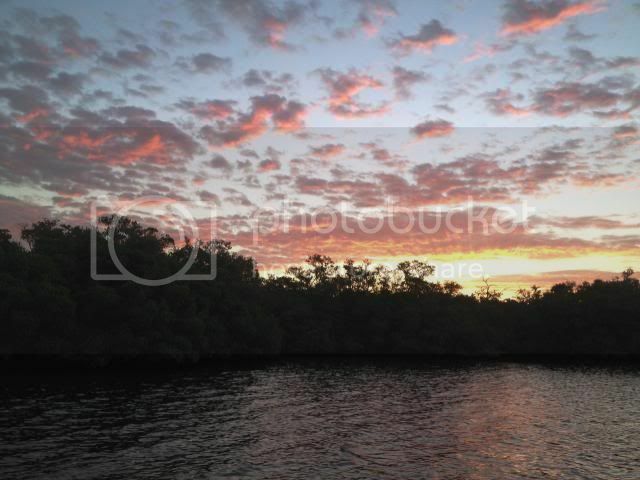 Mangroves, muttons and lanes can be found all over the river. The inlet and turning basin in Fort Pierce has been boiling some days with the mackerel, jacks, blue runners and ladyfish. The macks have been a good size and fun for anglers to catch. The mouth of the inlets have been good for snook and tarpon. You can find tarpon in the turning basin as well right now. Same goes for the surf when you can find the bait pods to fish along the beach. 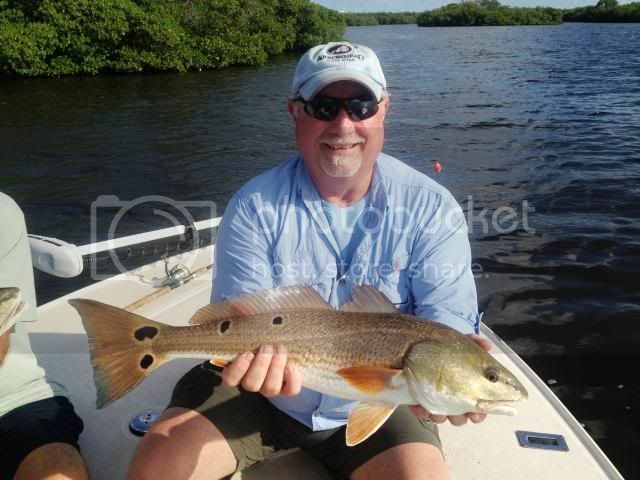 October has proved to be another great month of fishing along the Treasure Coast! Fall always brings out the best in fishing and weather for anglers. The rains have pretty much slowed now and you can enjoy the outdoors after a soggy, wet summer. Have fun and get out fishing! It has been a very good week, both the weather and the fish have cooperated to give us some memorable fishing trips. Mild conditions have made it very comfortable out on the water. The temperatures are milder now and the winds have slowed somewhat along with the rain. Look for more fall weather patterns throughout October. The fall mullet run continues with lots of bait pods all over the Treasure Coast and lots of hungry predators out there feeding on them. October is an exciting month to fish along the Treasure Coast! Clint Walker of the Fishing Center was out with me to do some scouting on the river. We found plenty of trout and snook on the flats. Clint topped off his day with a 33" beauty on a top water lure. Ron, Timberly and Mike was out for their October trip. 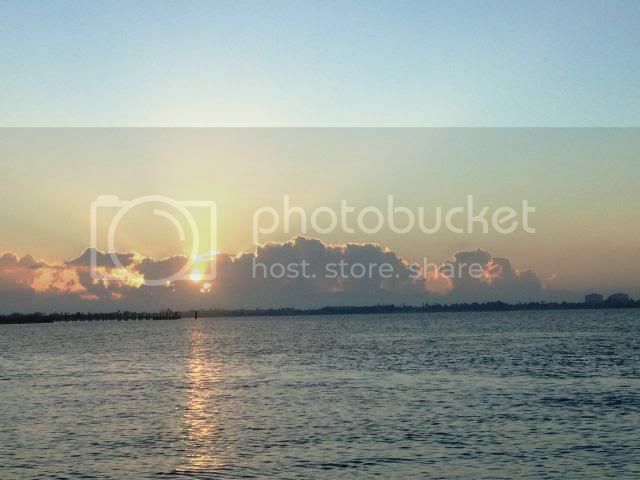 They caught redfish, snook, trout and snapper on a fun filled morning. The trout were in the 18" - 20" range. DOA Deadly Combos worked very well for the Mike and Ron that morning. 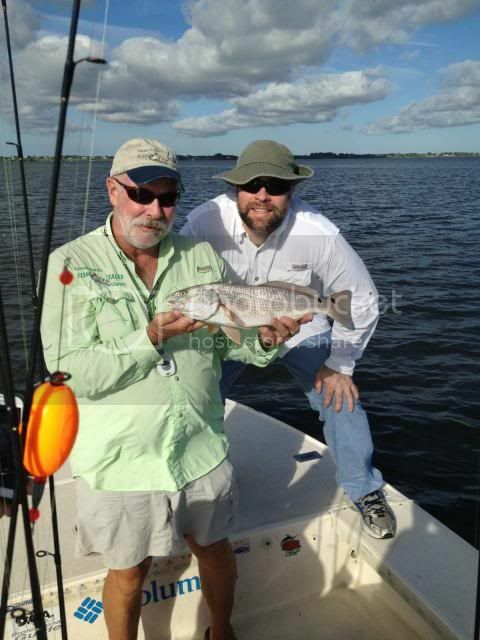 We had a four boat afternoon trip for a group and found trout, snook and snapper to be the catch of the day. I had Rick, Tim and Scott on my boat. They kept me laughing throughout the afternoon and had a great time fishing. Deadly Combos and live baits kept the rods bending for the group. 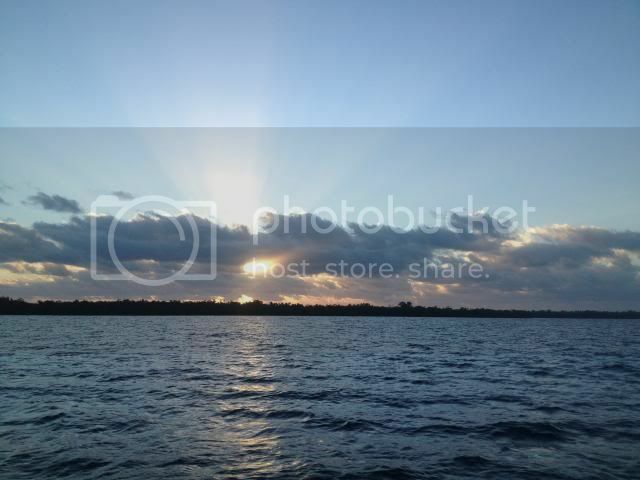 Bowman, Alex and Christian joined me for a beautiful morning on the Indian River. The guys started off with top water and switched to Deadly Combos and live baits for an exciting adventure on the water. 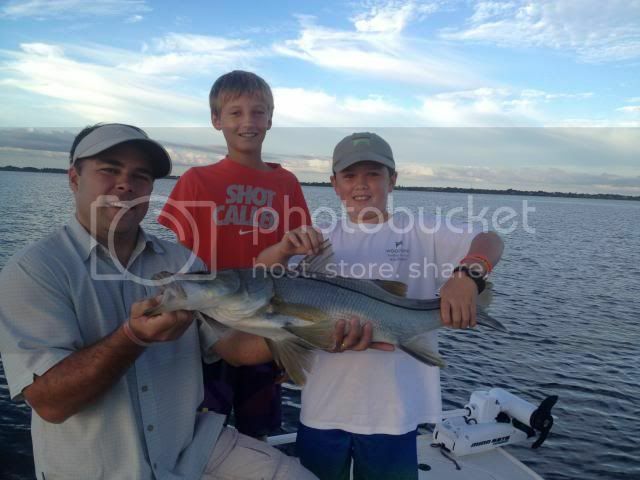 Bowman topped off his day with a 33" snook on a top water lure. Christian finished off a nice morning with a bonnet head shark that took him for a ride. It was a nice week to be fishing! Our trout and snook have been in three to four feet of water on the grass flats. We have been targeting sand bars and drop offs lately. It's good to see so many juvenile snook on the flats. The trout bite has been good in the same areas using DOA Deadly Combos. Top water lures, including DOA Bait Busters have worked very well in the mornings and should work just as good for evening anglers. Look for good action around the jetties for a variety of fish feeding on the mullet schools. Lots of jacks, bluefish and ladyfish in the turning basin of Fort Pierce lately gives any fisherman some exciting action. Along the beaches has been good when you find the bait running close to the surf. You can find tarpon, snook, jacks and bluefish chasing bait. There are still lots of snapper in the river. We are catching lots of them on the grass flats. I love October fishing! The mullet run will run through most of October and fishing around the bait will be rewarding for anglers. Use those top water lures in the mornings and you should get some good strikes on them this month. Fish moving water. The incoming tides have worked best for us this past week. Water moving over sand bars and drop offs have kept the fish hanging around those areas to feed and it's been exciting watching my clients fishing those areas. Lots of smiles this week! It was a busy week and the weather cooperated most days to keep us out of the rains. It was on the breezy side some days, but nice not to have the rain clouds chasing us around the river. Milder temperatures have arrived for a few days and it's been nice fishing conditions out there. We are in the transition from summer to fall weather. Expect milder temps and the water to cool down some this month. The fall mullet run continues around the Treasure Coast and lots of fish are out there looking for their next meal. October is a great fishing month! It was my fourth year at the Michael Shields Memorial Inshore Fishing Tournament this year. I had Rob and his son, Mason, on the boat from Rick's Redfish Neighborhood Grill in Port Saint Lucie. 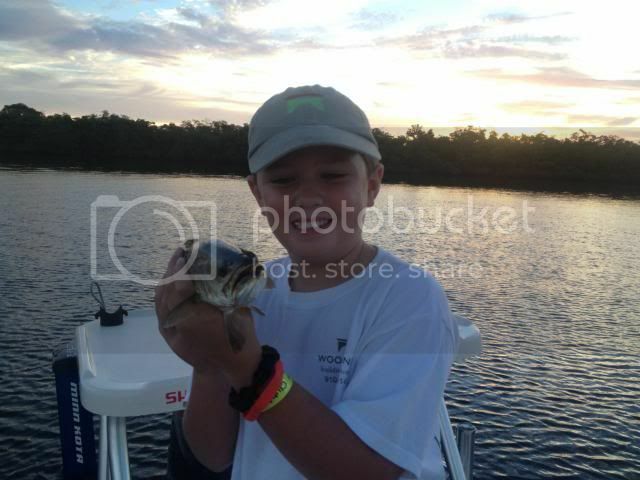 We kept Mason busy reeling in jacks and trout that morning. Mason was dragging a MirrOlure along side the boat and asking if we thought a fish might hit it......when a hungry sea trout slammed the lure and almost took the rod out of Mason's grasp. We all had a good laugh out of that experience. It was a fun morning with blue skies brighten our day. Dee Dee and Steve joined me for a morning on the river to celebrate Steve's birthday. 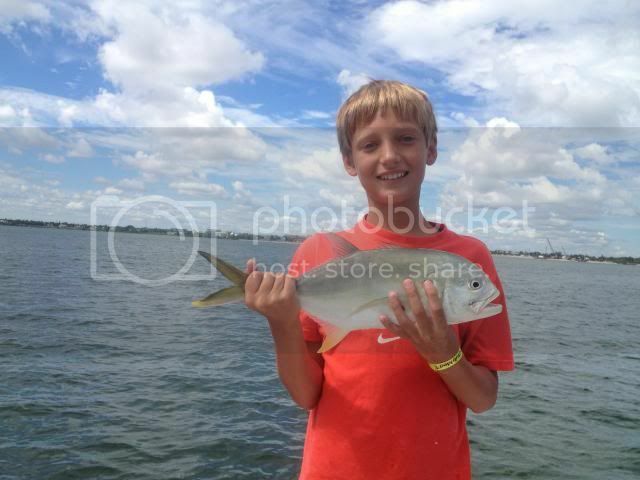 They caught a variety of fish including snook, trout, jacks & snapper. We dodged a few rain clouds and had a good time on the water. Jeff and Adam was out with me on a day that threatened rain, but missed us luckily. They caught a variety of fish, but Adam caught more juvenile grouper than I have seen in a while. We couldn't find the 24" fish though. 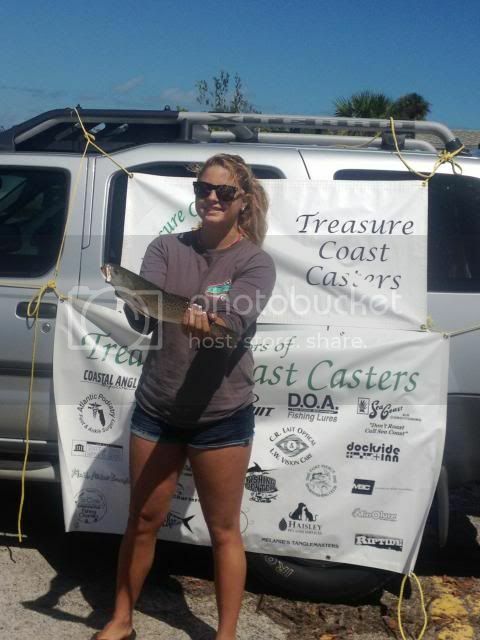 Sunday I helped with the Treasure Coast Caster Tournament and had Dylora Kolher on the boat for the tourney. 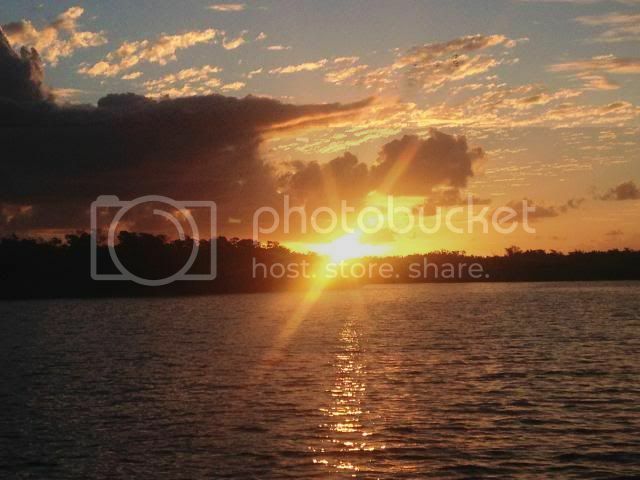 Dylora had a determination to catch fish that morning and proved herself right. 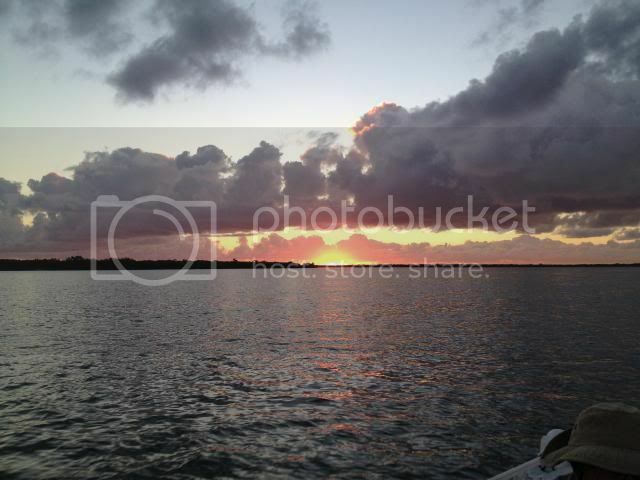 After catching her two sea trout, we embarked on our journey to catch two mangrove snapper. It took some time to sort through the short ones to find two the right size to check in. She continued to catch lots of fish including redfish, snook and jacks. The reds and snook were too short, but lots of fun to catch. 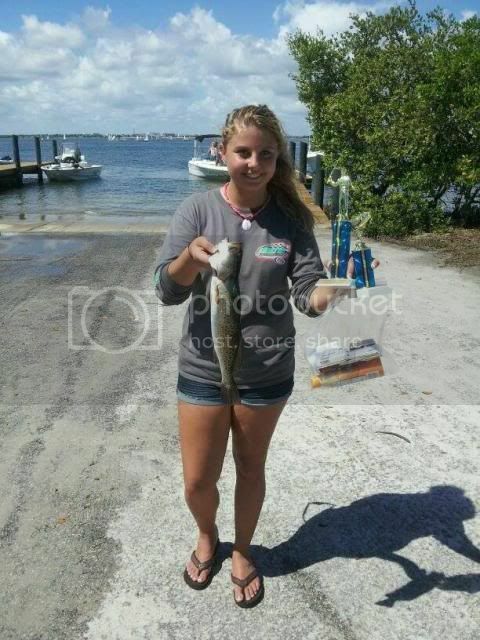 Dylora finished in first place for the high school division and biggest fish of the tournament. Congrats Dylora! If you have children that love to fish, contact Cammie at 772-201-5773 to see what the Treasure Coast Casters is all about. You can find them on Facebook as well. Our trout have been in three to five feet of water on the grass flats. 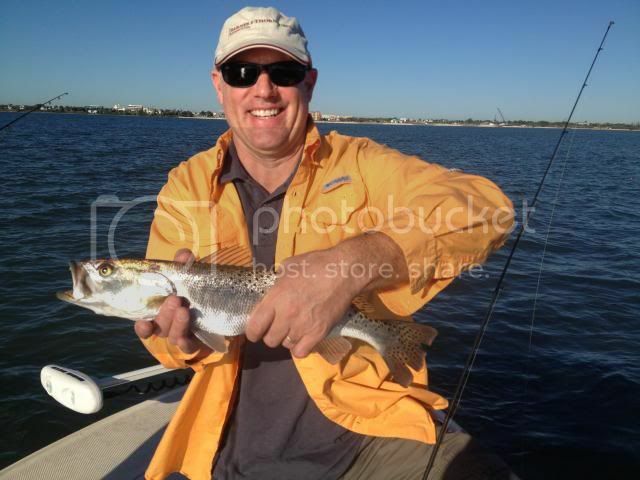 We had excellent success with DOA Bait Busters this week on trout and jacks on the flats. Continue to use the DOA shrimp as well when trout fishing. CAL grub tails found us lots of juvenile snook and redfish and some nice sea trout. Fish around the finger mullet schools and you should find fish lurking near them. Lots of snapper can be found just about anywhere you stop to fish on the river this month. Using the DOA Bait Buster as a top water lure is fantastic during the mullet run. It swims so realistic, that you can even find some finger mullet willing to follow it. 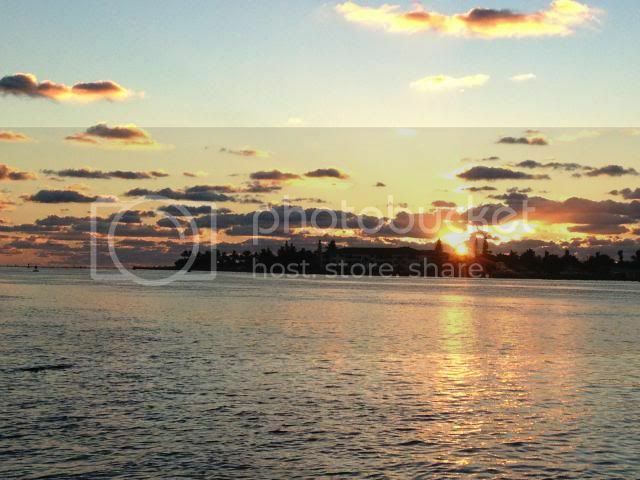 Watch for some tarpon around the jetties and turning basin feeding on the mullet. October will prove to be very productive on the Treasure Coast!